The Campylobacterales are an order of Proteobacteria which make up the epsilon subdivision, together with the small family Nautiliaceae. Like all Proteobacteria, they are Gram-negative. Most of the species are microaerophilic. 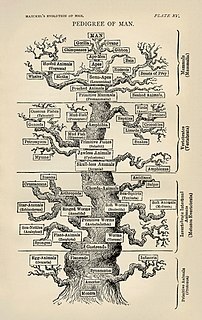 Molecular phylogenetics is the branch of phylogeny that analyzes genetic, hereditary molecular differences, predominately in DNA sequences, to gain information on an organism's evolutionary relationships. From these analyses, it is possible to determine the processes by which diversity among species has been achieved. The result of a molecular phylogenetic analysis is expressed in a phylogenetic tree. Molecular phylogenetics is one aspect of molecular systematics, a broader term that also includes the use of molecular data in taxonomy and biogeography. Helicobacter pylori, previously known as Campylobacter pylori, is a Gram-negative, microaerophilic bacterium usually found in the stomach. It was identified in 1982 by Australian scientists Barry Marshall and Robin Warren, who found that it was present in a person with chronic gastritis and gastric ulcers, conditions not previously believed to have a microbial cause. It is also linked to the development of duodenal ulcers and stomach cancer. However, over 80% of individuals infected with the bacterium are asymptomatic, and it may play an important role in the natural stomach ecology. Helicobacter is a genus of Gram-negative bacteria possessing a characteristic helical shape. They were initially considered to be members of the genus Campylobacter, but in 1989, Goodwin et al. published sufficient reasons to justify the new genus name Helicobacter. The genus Helicobacter contains about 35 species. Campylobacter jejuni is one of the most common causes of food poisoning in Europe and in the United States. The vast majority of cases occur as isolated events, not as part of recognized outbreaks. Active surveillance through the Foodborne Diseases Active Surveillance Network (FoodNet) indicates that about 14 cases are diagnosed each year for each 100,000 persons in the population. The European Food Safety Authority estimated in 2011 that there are approximately nine million cases of human campylobacteriosis per year in the European Union. Campylobacter fetus is a species of Gram-negative, motile bacteria with a characteristic "S"-shaped rod morphology similar to members of the genus Vibrio. Like other members of the genus Campylobacter, C. fetus is oxidase-positive. This is a timeline of the events relating to the discovery that peptic ulcer disease and some cancers are caused by H. pylori. In 2005, Barry Marshall and Robin Warren were awarded the Nobel Prize in Physiology or Medicine for their discovery that peptic ulcer disease (PUD) was primarily caused by Helicobacter pylori, a bacterium with affinity for acidic environments, such as the stomach. As a result, PUD that is associated with H. pylori is currently treated with antibiotics used to eradicate the infection. For decades prior to their discovery, it was widely believed that PUD was caused by excess acid in the stomach. During this time, acid control was the primary method of treatment for PUD, to only partial success. Among other effects, it is now known that acid suppression alters the stomach milieu to make it less amenable to H. pylori infection. Elizabethkingia meningoseptica is a gram-negative rod-shaped bacterium widely distributed in nature. It may be normally present in fish and frogs; while it may be isolated from chronic infectious states, as in the sputum of cystic fibrosis patients. In 1959, the American bacteriologist Elizabeth O. King was studying unclassified bacteria associated with pediatric meningitis at the Centers for Disease Control and Prevention in Atlanta, when she isolated an organism that she named Flavobacterium meningosepticum. In 1994, it was reclassified in the genus Chryseobacterium and renamed Chryseobacterium meningosepticum(chryseos = "golden" in Greek, so Chryseobacterium means a golden/yellow rod similar to Flavobacterium). In 2005, a 16S rRNA phylogenetic tree of Chryseobacteria showed that C. meningosepticum along with C. miricola were close to each other but outside the tree of the rest of the Chryseobacteria and were then placed in a new genus Elizabethkingia named after the original discoverer of F. meningosepticum. Helicobacter cellulitis is a cutaneous condition caused by Helicobacter cinaedi. H. cinaedi can cause cellulitis and bacteremia in immunocompromised people. 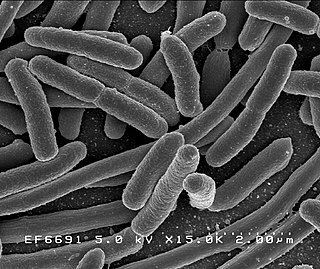 Cedecea is a genus of extremely rare bacteria of the family Enterobacteriaceae. The name of this genus was derived from CDC, the abbreviation for the Centers for Disease Control where the initial members of this genus were discovered. This genus resembles no other group of Enterobacteriaceae. Cedecea bacteria are Gram-negative, bacillus in shape, motile, nonencapsulated, and non-spore-forming. The strains of Cedecea appear to be similar to those of Serratia. Both Cedecea and Serratia are lipase positive and resistant to colistin and cephalothin; however, Cedecea is unable to hydrolyze gelatin or DNA. Arcobacter is a genus of Gram-negative, spiral-shaped bacteria in the class Epsilonproteobacteria. It shows an unusually wide range of habitats, and some species can be human and animal pathogens. Species of the genus Arcobacter are found in both animal and environmental sources, making it unique among the epsilonproteobacteria. This genus currently consists of five species: A. butzleri, A. cryaerophilus, A. skirrowii, A. nitrofigilis, and A. sulfidicus, although several other potential novel species have recently been described from varying environments. Three of these five known species are pathogenic. Members of this genus were first isolated in 1977 from aborted bovine fetuses. They are aerotolerant, Campylobacter-like organisms, previously classified as Campylobacter. The genus Arcobacter, in fact, was created as recently as 1992. Although they are similar to this other genus, Arcobacter species can grow at lower temperatures than Campylobacter, as well as in the air, which Campylobacter cannot. Helicobacter canis is a bacterium in the Helicobacteraceae family, Campylobacterales order. Its type strain is NCTC 12739T. It colonises the lower bowel, but is also present in cases of hepatitis. Besides infecting dogs, this bacterium is known to cause infections in immunocompromised humans. Campylobacter lari is a species of nalidixic acid-resistant, thermophilic, microaerophilic bacteria first isolated from human faeces. It shows anaerobic growth in the presence of trimethylamine N-oxide hydrochloride. Its type strain is NCTC 11352. It is commonly found in sea gulls. In humans, it has been involved in cases of enteritis, severe abdominal pain and terminal bacteremia. Acinetobacter junii is a species of bacteria. Its type strain is ATCC 17908. It can be pathogenic. This bacterium has been linked to nosocomial infections including catheter-related blood stream infections and cellulitis. Helicobacter felis is a bacterium in the Helicobacteraceae family, Campylobacterales order. It can be pathogenic. It is part of the gastric mucosa of cats, and is Gram-negative, microaerophilic, urease-positive, and spiral-shaped. Its type strain is CS1T. Tsukamurella inchonensis is a bacterium with type strain IMMIB D-771T. Campylobacter showae is a species of Campylobacter found in humans. It is gram-negative, straight rod-shaped, motile by means of multiple unipolar flagella. It is asaccharolytic and prefers an anaerobic atmosphere. SU A4 is its type strain. Its genome has been sequenced. Dietzia is a Gram-positive bacterial genus from the family of Dietziaceae which occur in many different habitats including humans and animals. The species Dietzia maris is a human pathogen. The genus Dietzia is named after the American microbiologist Alma Dietz. Bergeyella is a rod-shaped, Gram-negative, aerobic, non-spore-forming and non-motile genus from the family of Flavobacteriaceae. Bergeyella zoohelcum is a Gram-negative, rod-shaped, aerobic and non-motile bacterium from the genus of Bergeyella which occurs in the upper respiratory tract of dogs and cats Bergeyella zoohelcum can cause respiratory disease in cats. Bergeyella zoohelcum can cause infections after dog bites. ↑ Vandamme P, Falsen E, Rossau R, Hoste B, Segers P, Tytgat R, De Ley J. "Revision of Campylobacter, Helicobacter, and Wolinella taxonomy: emendation of generic descriptions and proposal of Arcobacter gen-nov". International Journal of Systematic Bacteriology. 41 (1): 88–103. doi:10.1099/00207713-41-1-88. PMID 1704793. ↑ Kiehlbauch JA, Tauxe RV, Baker CN, Wachsmuth IK (1994). 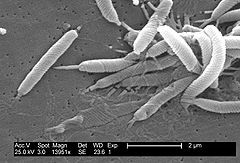 "Helicobacter cinaedi-associated bacteremia and cellulitis in immunocompromised patients". Annals of Internal Medicine. 121 (2): 90–93. doi:10.7326/0003-4819-121-2-199407150-00002. ↑ Garrity GM, Brenner DJ, Krieg NR, Staley JT (eds.) (2005). Bergey's Manual of Systematic Bacteriology, Volume Two: The Proteobacteria, Part C: The Alpha-, Beta-, Delta-, and Epsilonproteobacteria. New York, New York: Springer. ISBN 978-0-387-24145-6.